Juan de Dios Crespo, Ruiz Huerta & Crespo Lawyers (Spain), and Iusport; and Alfonso Valero, Nockolds Solicitors (UK) and Iusport. Juan de Dios Crespo is one of the Partners of the Ruiz Huerta & Crespo, one of Spain’s leading law firms. He is one of Europe’s leading specialists in sports law and the application of EU law. Juan de Dios has been involved in several of the most important sports litigation cases of recent years (Rodríguez/Bueno; Granada 74; Webster). He is an Arbitrator of the Valencia Chamber of Commerce as well as in proceedings at the International Chamber of Commerce (ICC) International Court of Arbitration in Paris. He is also President of the Sports Law Section of the Valencia Bar and a regular speaker at legal and sports business seminars. He has published numerous legal papers. 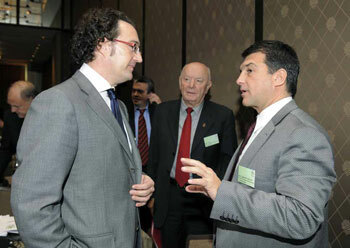 Juan de Dios in conversation with FC Barcelona President Joan Laporta following Juan’s lecture to representatives of the 95 European Club Association (ECA) members and UEFA representatives at their meeting on 10th February in Geneva (Switzerland). The ECA, the official organisation representing major European football clubs (recognised as such by UEFA), invited Juan to its First Annual Conference to speak about the cancellation of the footballers’ contracts by virtue of Article 17 of the Regulations for the Status and Transfer of Players (“From Webster to Matuzalem and the future of Article 17”). Alfonso Valero is a member of the Sports Department of Nockolds Solicitors and is the UK Editor of Iusport, a leading website focusing on current legal issues in sports. He has published numerous articles within the field. As well as sports law, he also practices as a cross border litigator in matters affecting England and Spain. He regularly attends conferences and gives seminars about sport. Iusport, the sports law web.